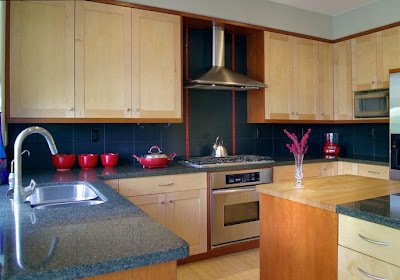 Kitchen and Residential Design: Back to kitchen design: framed or frameless? I mentioned a couple of weeks ago that I'm working on two jobs that are using honed marble counters. One of them is about to start construction and it will be a beauty. As work progresses on that job, I'll post some photos of it. But in the meantime, the cabinetry going into that kitchen is what we call inset cabinetry. Inset is one of the three overlay styles available in the world of framed cabinetry and it's hands-down my favorite. Since terms like that have meaning for so few people, it's time for a little cabinetry 101. 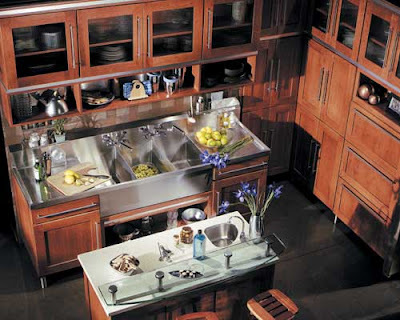 Cabinetry is made in two primary construction styles, framed and frameless. Here's a shot of what I mean by framed cabinetry. Framed cabinetry has a face frame that functions as a fourth side to a cabinet box, and it makes them more structurally sound. The door hinges on a framed cabinet attach to this frame. Frameless cabinetry has no fourth side. 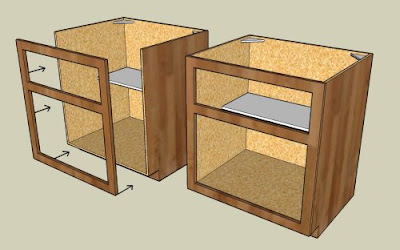 On a frameless box, the door hinges attach to the insides of the cabinet itself. Oftentimes, a framed cabinet is referred to as a European box. 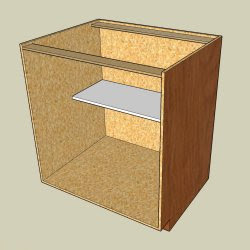 A lot of people who sell frameless cabinetry make a big production out of the difference in the interior size of a frameless box over a framed box. That size difference can be measured in cubic centimeters and it's an amount of space I'd trade for increased strength any day. There are partisans on both sides of cabinetry construction style rift, and you can place me firmly in the camp of the framed fans. In day to day use, I defy most people to tell the difference between the two and when asked, most people have to run into the kitchen to check which kind they have. I like framed cabinetry because it allows me more flexibility. Framed boxes allow me to go larger and wider with my designs because its a stronger construction method. Every kitchen designer I know has a preference of one over the other, but at the end of the day, I don't think most clients will notice a difference between the two. This kitchen was made with frameless cabinetry. And this one was put together with framed cabinetry. See the difference? I thought not. So there are the two construction styles you're most likely to run across in the world of cabinetry. 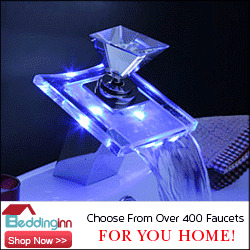 Far more important than which style you buy is that you find a designer whom you trust and who listens to you. Tune in tomorrow for part two of my cabinetry 101 when I'll discuss the three overlay styles of framed cabinetry. Now THAT is the clearest, most concise explanation of framed v. frameless that I have ever heard. Kudos to you, Paul.